A stray sprig throws off years of data and research. Tim Bradbeer of League City, Texas, was nearly ready to call it a hunt on the last day of the first split of the season, but then, he had a visitor. "We needed one more duck to fill our limit," Bradbeer explained. The duck happened to be a beautiful bull sprig, adorned with a silver band. A certain amount of incredulity among hunting partners exists when one hunter tells another the story of how a banded bird was collected. But Bradbeer's story is so incredible, even the folks who banded the pintail didn't believe the data when it was first reported. Pintail populations have been declining for decades, and the species is well below the long-term average and the objective level established by the North American Waterfowl Management Plan. Bradbeer's pintail was banded in an area of north-central Alaska known as the Yukon-Koyukuk Census Area as part of an international pintail recovery initiative being conducted by a team of waterfowl biologists with the U.S. Geological Survey, U.S. Fish and Wildlife Service, Ducks Unlimited's Institute for Wetland and Waterfowl Research, California Waterfowl Association and Texas Parks and Wildlife. The overriding goal is to identify and quantify factors limiting northern pintail populations. Much of the research depends on identifying migration routes through band reports and satellite tracking. As a result, the group has generated a fairly accurate map of where specific breeding populations migrate, stop over and winter -- at least they thought they had. Bradbeer submitted the information to the USGS and anxiously waited. He received a certificate of appreciation and a letter from the USGS. "They asked me to double-check the band number, and also double-check if I had moved," he said. Bradbeer hadn't moved, but the pintail sure had. A straight line distance from banding to recovery locations of more than 3,500 miles is remarkable. 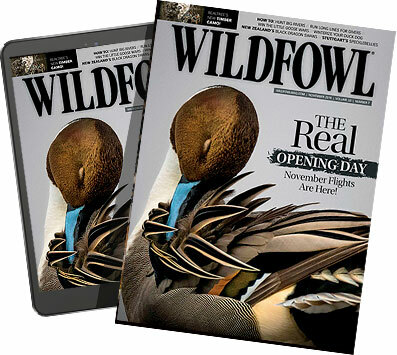 Bradbeer's band report shows not only how Mother Nature continues to confound our attempts to categorize creatures, but also emphasizes the important contribution wildfowlers make to waterfowl research. You can read more about the project and at //www.werc.usgs.gov/pinsat/index.html. But even more remarkable, at least to the biologists, were the specific locations. According to the banding data, Alaska's breeding pintails stick to the Pacific Flyway, wintering in central California. Some might dogleg as far east as southern Alberta and Saskatchewan, but typically veer back west on the northward and southward migrations. Pintails that winter in Texas typically come from the prairie pothole region, although some breed as far north as the Northwest Territories. "My data threw all other data off," Bradbeer said. It also very likely sent the biologists back to reexamine their data sets. At first glance, it might seem like a bit of a setback to the research. However, it could just as easily prove to be a missing link or an important piece of the pintail decline puzzle.